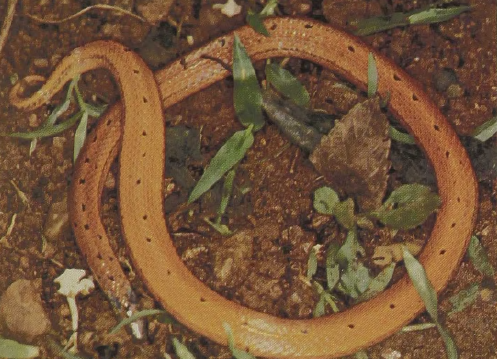 Four species of these diminutive fossorial (hiding) snakes have been described from the island of Sri Lanka. While they have a more or less conical head, they are higher snakes (colubrids) and not related to the uropeltids also found on that island. The body is stout, the tail short and pointed, and the color shows amazing variability ranging from bright reds to dark browns and black, often in the same locality. Similarly the ventral surface may be clear or marbled. These small snakes, rarely exceeding 12 inches in length, lay their eggs in cavities 6 to 12 inches deep within the soil. Ground snakes are common in marshy areas and in irrigated agricultural regions. They may be enormously abundant in some tea plantations where they must represent an important control agent for invertebrate pests. These snakes are often found in the same place and seem to feed on the same worms as Rhinophis, but these two seem to be immune to each other’s parasites.